Schools from across Dundee City and Angus were included in the first-ever Schools Design Challenge organised by the city’s future design museum, the V&A Dundee. Since October 2015, more than a thousand 11-12 year-old local pupils have attempted to use design to change their daily environment. The 2016 event saw innovations such as an anti-bullying robot and tablets loaded with educational software run by a pedal-powered desk submitted. The Design Jam in January produced several concepts, which will be shown at a special exhibition in Dundee’s Overgate shopping centre in March. The nine teams in the event were supervised by local designers and film-makers in order to encourage them to use design as a problem-solving tool. 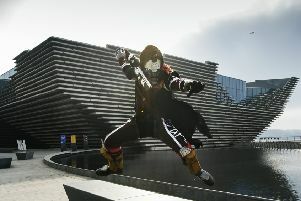 Joanna Mawdsley, Learning Manager for Schools, Young People & Families at the V&A Museum of Design Dundee said: “We looked at Dundee’s UNESCO City of Design status and the potential to use design tools for social change instead of just creating a product. “The project highlights how design can trickle down into different subjects. It’s always been our goal to influence people’s direction by getting kids involved in design. Entries included a bird-watching hide from Craigie High School, a remembrance tree from Braeview Academy and Grove Academy’s social enterprise cyber cafe to raise money for social causes. Each of the nine groups were mentored by experienced designers including independent game designer Malath Abbas of Quartic Llama, Kirsty Maguire of Kirsty Maguire Architect Ltd and Duncan of Jordanstone art college lecturer Lindsey McIntosh. Senior Education Officer for Expressive Arts at Education Scotland Ron Cowie said: “We have been meeting with colleagues from V&A Dundee to share ideas and information about the development of ‘design thinking’ in the Scottish curriculum. Joanna added: “The young people could ask their mentor questions about their daily work to get a feel for the job. “Our first event built a genuine excitement for design, and the idea is now to have Design Jams every other year. The next event in 2017 will be in the run-up to the opening of the museum. It feels like a strong start as the pilot has worked so well and teacher feedback has been great.